I hope you all are having a wonderful weekend so far! I'm very excited to review the product we are today not only because it's made by a friend but also because I've been using these soaps for quite awhile and I ABSOLUTELY love them. 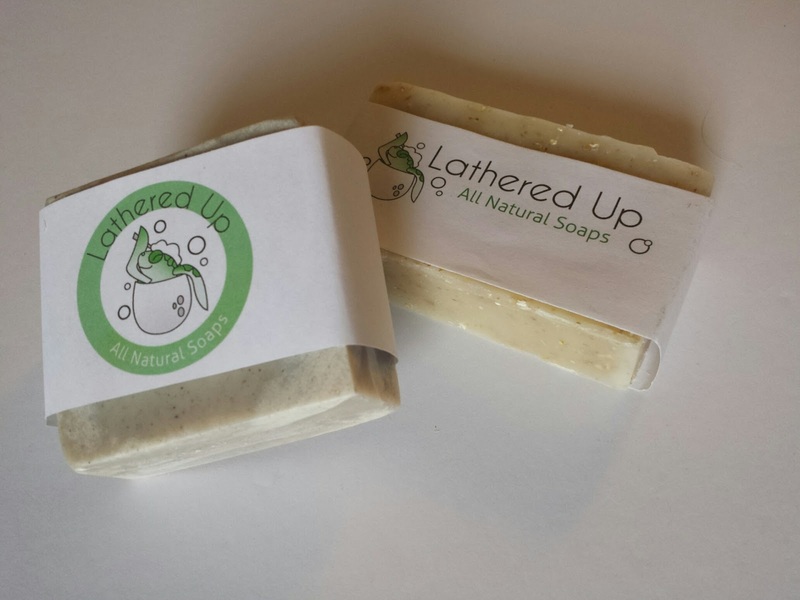 A few weeks ago I was asked to review Lathered Up Soaps by Stephanie and I immediately took her up on her offer. I've tried many different kinds now and I have to admit I always have them in my bathroom. Steph: This product is definitely one of my favourites. I tend to have dry and somewhat itchy hands in the fall/winter months and washing with this soap has really helped me because I find it very soothing and also exfoliating. I used this as a hand soap for awhile before actually deciding to try it in the shower and I am SO glad I did. Rubbing the soap directly on my skin felt great and better than any luffa or exfoliating sponge I have ever tried. It was exfoliating but not irritating and made my skin feel incredibly soft. I would definitely use this product again and again! Truly wonderful. Jenn: I enjoyed trying out this bar of soap, the smell is subtle but nice and soothing, definitely not over powering. I love the exfoliation it provides, especially on my legs. I typically like something with a much stronger fragrance so for me I will lean towards a more scented soap. I love the generous sized bar and presentation of the product. Totally recommend this soap to anyone who needs that extra exfoliation without the strong perfumes some soaps have. Jenn: I have tried so many facial cleansers, it's kinda ridiculous! So trying this one was definitely a must. I used this soap for the first time and was not careful keeping it away from my eyes, as a result my eyes were so red and burny. Therefore this product is not something you want to use to remove eye makeup with. Maybe it's just me but I typically use my face wash to also remove my eye makeup. I do like the natural scent this facial soap has and I did not find it irritating to my sensitive acne prone skin. It was effective in removing heavy facial makeup, and was moisturizing at the same time. Steph: I don't tend to try many cleansers as I've finally found one that works well for my skin. I did find this one did not irritate my skin whatsoever (which I've had issues with in the past when I've tried others). It did make my skin feel VERY soft and I loved the way that it lathered right up. The smell of this one is very natural and pleasant. Would recommend for someone looking to try something new! Jenn: I will be purchasing this one when I place my order, I need this soap in my rotation. The smell is beautiful and soft, and the bar of soap produces a nice luxurious lather. It makes my skin feel so squeaky clean without feeling dry. I tend to have very dry underarm areas that have patches, since using this soap my underarms have definitely improved. I also really like that the smell of this soap sticks to your skin, so even after rinsing I can still smell that beautiful hint of lavender after the bath. I love love love this one! Steph: This one is by far my favourite! I've used about 3-4 bars of this soap since the start of the year and I have to admit it's always in one of my two bathrooms. It smells absolutely amazing and really gives you a clean feel. In the winter when I had extremely dry and scaly skin on just one of my hands (weird right?) it improved the dryness drastically! I couldn't believe the difference. I will definitely be keeping this in my regular rotation. After using this soap for well over a year I really can't say one bad thing about any of them! 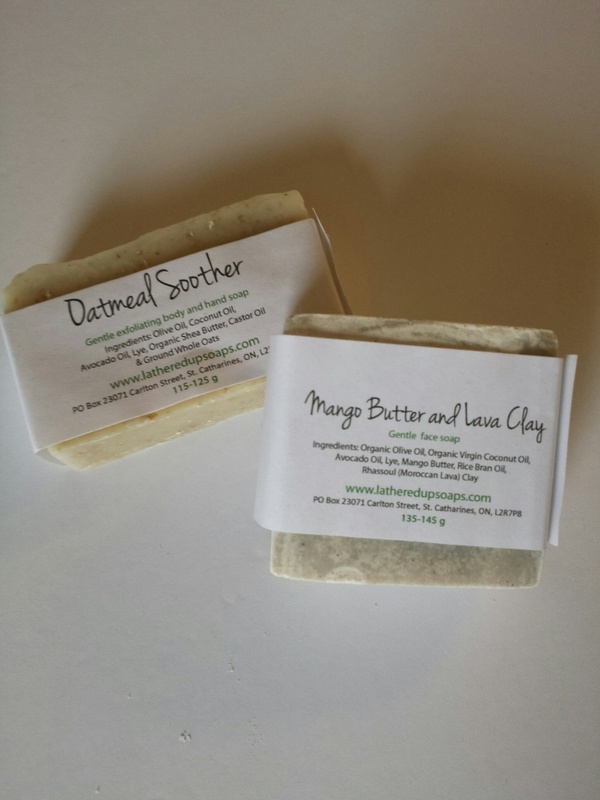 Who doesn't like an all natural soap that still sells incredible? My newest favourite is the Lavendar Lemon Grass as it makes my bathroom smell absolutely amazing at ALL times! When I was my hands with it I seriously close my eyes and enjoy the moment! This is one my new staple soap! Thanks so much for reading! Stay tuned for a giveaway we will be posting later in the week!